"It's time to reload your light gun because Time Crisis 3 has finally exploded on the PlayStation 2." Those bad 80's movies have returned in Time Crisis 3 that showcases the best of "bad" voice acting, extremely lame stories and first grade violence that make the Time Crisis series a thoroughly enjoyable experience. Namco have just released the latest instalment of the series on the PlayStation 2 and decided to up the ante of this awesome light gun series with an improved gaming engine that puts its predecessors to shame. Time Crisis 3 follows our two favourite agents who are agents Wesley Lambert and Adam Dunaway who prove that deadly violence is the only way to solve a mystery and to protect the lives of the innocent. The basic premise behind Time Crisis 3 is to shoot the enemies characters that flood the screen and to duck when the fire fight becomes a little too heated... or to reload your weapons. The game also introduces a new character to the series called Alicia Winston who is a liberation fighter that wishes to bring vengeance on the main villain because of the abduction of her brother. 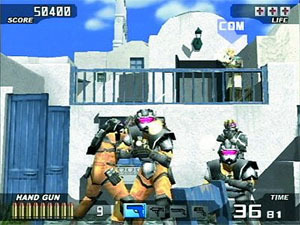 The control system of Time Crisis was exclusively designed for the PlayStation G-Con 2 but a variety of third party guns are also compatible with this title. For those that are unlikely enough not have a G-Con 2, the game also supports the traditional Sony DualShock controller that uses the two analog sticks to control your character, the X button to fire and the R1 button to duck. Although the game has no save feature, you are awarded a certain amount of credits that allows you to continue when you have been killed. Fortunately as you continue, you are awarded extra credits for performing well during the game itself. The combat system of Time Crisis is brilliant and although it is a little forgiving with its auto aim system, it is still a fun and entertaining game. There is a variety of enemies in the game that include huge military tanks, soldiers, ninjas and just about everything that made a good 80's action movie. Time Crisis also has a new weapon switching system that allows you to switch between weapons with ease, no matter what weapon you have in your inventory, whether it's a deadly handgun or a powerful grenade launcher. This is done by ducking while pulling the trigger at the same time and works flawless with the G-Con 2. There is also a new sniper mode that can only be unlocked once you have helped Alicia rescue her brother. This new gameplay modes allows you to "sniper" in on the enemies by using the A and B buttons on the G-Con 2 to zoom in. Although it's nothing too complex, it does make a nice addition to the Time Crisis genre. 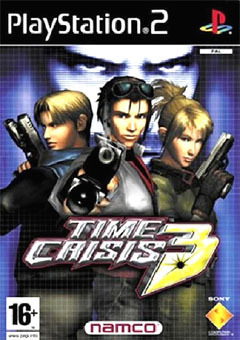 Time Crisis 3 is a very sturdy game graphically and uses the gaming engine to its full advantage by making it totally interactive with the player. The characters themselves, although they don't contain a ridiculously amount of detail are well modelled and contain some great texture details. All the characters move with human-like fluidity from jumps, rolls and the way they shoot their guns that has been nicely incorporated into the game. 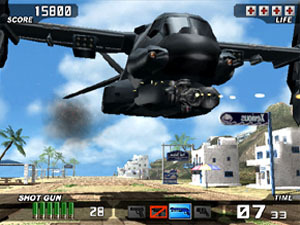 The game also supports a variety of locales from tropical islands and deserts to high speed trains that ensures that the gameplay never becomes tiresome. Apart from the great character models and backgrounds, the developers have done a great job at recreating the explosions in the game that look like they have been directly taken from a true Hollywood action movie. The musical score of Time Crisis 3 is 80's arcade at its best with a cheesy but enjoyable soundtrack that suits the game perfectly. The game also contains a variety of huge explosions that sounds phenomenal through the right home entertainment setup and also some great "cheesy" voice acting that if it didn't exist, would actual harm the game. The guns themselves sound extremely realistic and there is of course the sounds of enemies being maimed and killed and various other action noises. Time Crisis 3 by Namco won't win any awards for originality and most professional gamers should be able to finish the game within a few hours on easy mode. 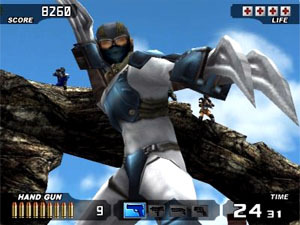 But Time Crisis 3 has a few extra tricks up its sleeve like a great multiplayer option that can be played over and over again. I highly recommend the two player mode on widescreen televisions because it splits the screen perfectly and each player has enough game screen to play the title comfortably. Once again Namco have produced a quality light gun title!